The Classical Theory of Interest came in for serious criticism at the hands of Keynes. firstly. 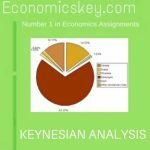 it is pointed out that Classical heory of interest is based upon the assumption of full employment of resources. . In other words. it assumes that an increase in the production of one thing must mean the withdrawal of some resources from the production of other things. “Within the Framework of a system of theory. built on the as- .gumption of full employment. the notion of interest as a reward for waiting or abstinente is highly plausible. It is the premise that resources are typically fully employed that lacks plausibility in the contemporary world,”” If at any time in the country. unemployed resources are found on a large scale. there is no need (or paying people to abstain From consumption. i.e to wait ill order tl)at more resources should be devoted to the production of capital goods. SCHmidly, according to the Classical Theory of interest, more investment (production of capital goods) can take place only by curtailing consumption. Greater the reduction of consumption more arc the saving and. therefore. more investment. Out a decrease in the demand for consumer goods is likely to lessen the incentive to produce capital goods and therefore, will affect investment adversely. Thirdly, by assumption full employment. the classical theory has neglected the changes in the income level. By neglecting the changes in the income level. the classical theory is led into error of viewing the tate of interest as the factor which brings equality of saving and investment As Keynes asserts. equality between savings and investment is brought about not by changes in the rate of interest but by changes in the level oF income. Fourthly, according to the Classical Theory, the investment demand schedule can change or shift without ‘Dg a change or shift in the saving curve schedule. For example. according to classical theory. if in- schedule or curve shifts down the new equilibrium rate interest will be determined here this new investment demand the old saving curve which has remained ed. Bill this is wrong. As we know Economics, Carlin investment leads to decrease income and out the reduced income. less is said thereFore savings curve also changes. The see that classical theory ignores the effect changes in in vestment on savings. the Classical Theory. as pointed out by Keynes. is indeterminate. Position or the savings schedule or curve depends upon the income level. that is, the position of the savings curve or schedule will vary with the level or in Conics. There will be different savings schedules for different levels of incomes. As income rises, for example, the savings schedule or curve will shift to the right. Thus, we cannot-know what the rate of interest will be unless we already know what that the income level is. And we cannot know the income level without already knowing the ~ate of interest, since a lower interest rate will mean a large volume of investment and so via the multiplier, a higher level of real income. The classical theory, therefore, offers no solution and is indeterminate.